So this morning after I tweeted a picture of my new favorite coffee mug, Liz of Elizziebooks said she thought it was cool (thanks!) and that she needs more nerdy coffee mugs in her life. Obviously I agree with both sentiments. Which got me thinking about all the other coffee mugs in my cabinet. 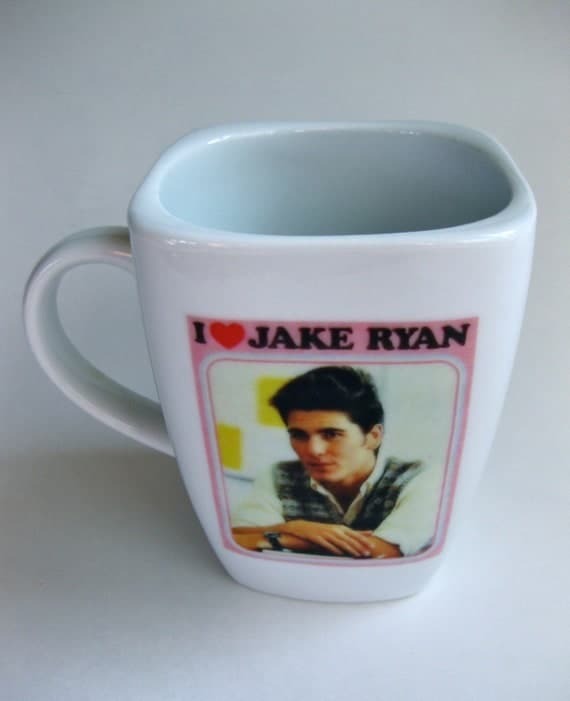 Which got me thinking about my favorite coffee mugs. Which got me thinking I should share that with y'all because I haven't blogged in awhile and because coffee mugs are like bow ties and fezzes - they're cool. Left: The Red Filigree mug is GORGEOUS, right? And it's huge. No special story. Just a big, beautiful mug. Middle: Like No (M)other mug is from Caribou Coffee (which is like Starbucks of the Midwest). I have a million Caribou mugs of different varieties, but I adore the size of this massive mug as well as the red & teal combo. It's one of my favorite color combos evah. 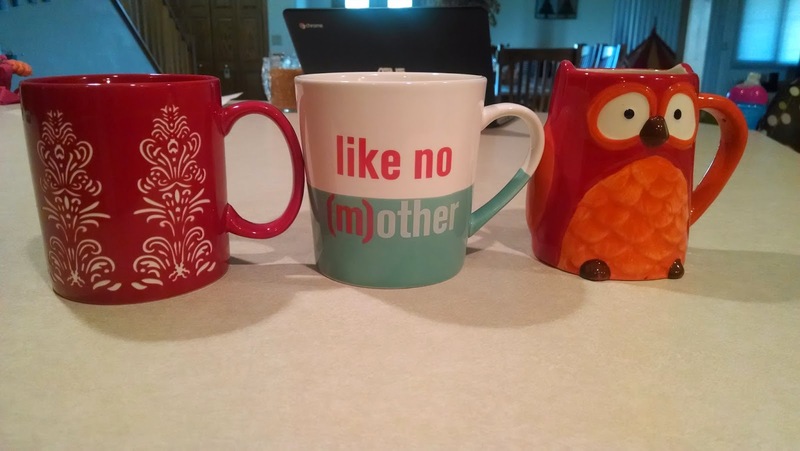 Right: That Owl mug was a gift from my husband. It's adorable. It's actually pretty amazing considering he's trying to curb my coffee mug hoarding so whenever I get one from him, it is most treasured indeed. Left: Another owl mug! This one is from my darling sister-in-law for Christmas last year. I just love that mossy green handle and all those cute owl mugs on my mug. 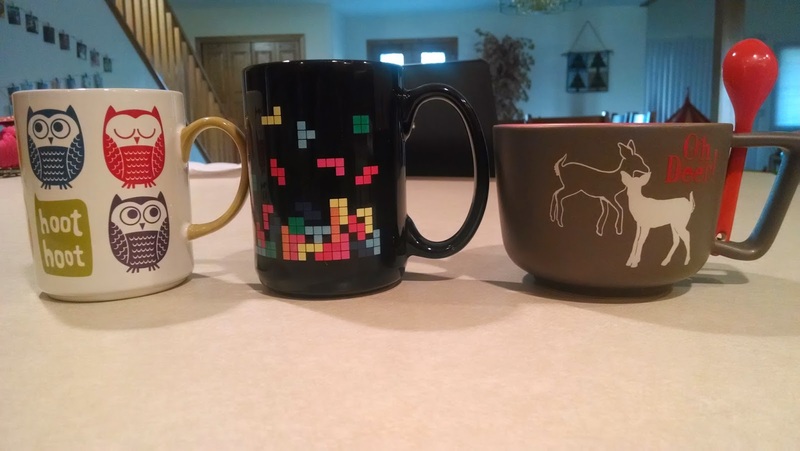 Middle: Tetris mug! Courtesy of Think Geek. I bought this for my husband but I end up using it a ton because it's a great size, weight, and is classic nerdy chic. Right: Oh, Dear! mug is from my Broke & Bookish Secret Santa two years ago! I mean seriously, the mug has a spoon, y'all. I used this like 2 days ago with my hot chocolate because I dunno about you, but my cocoa separates instantly and all the good stuff sinks to the bottom of the cup. Not with this mug! I can stir it up to keep it at maximum deliciousness. And I do just that. Left: STAR WARS MUG. Also from Think Geek, I'm sure. It's a classic, man. Middle: Dumbledore Stein. So here's the deal with this one - my mom & brother went to HP World like 3 years ago and she's had the mug and just forgotten to give it to me for that long. When we went to TX this past May, I finally got to hold that handsome wizard in my tiny little hands. It's massive. It barely fits in my cupboard. I LOVE IT. 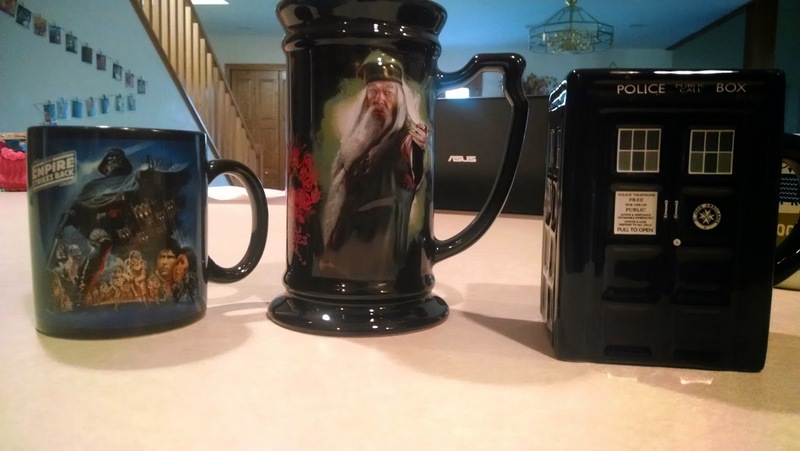 Right: Obviously I have the Dr. Who Tardis mug. OBVIOUSLY. From Think Geek of course. Not pictured is the little top that goes with it because ain't nobody got time for that, despite it being super cute. 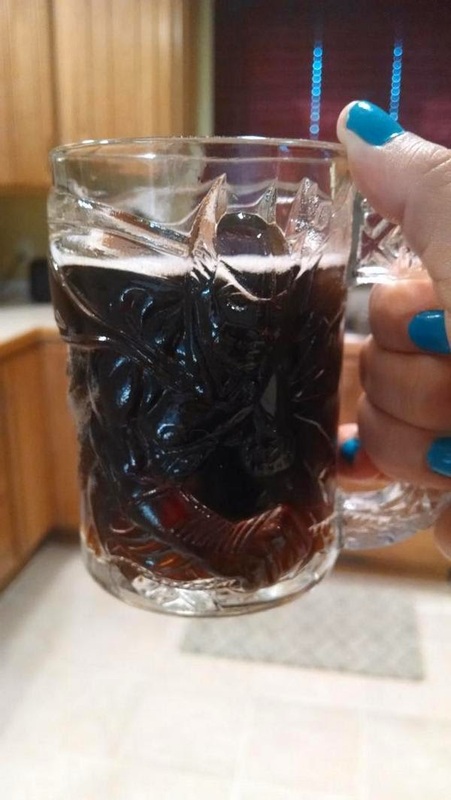 My number one favorite mug right now is this little glass Batman Forever mug! And I'll tell you why. So you know how I went to Chicago with a gaggle of teenagers for a week? Well, me and a couple of the teens helped sort a gajillion items for a clothes closet. Among the sorting, we found this mug. I FLIPPED MY LID because (1) IT IS BATMAN and (2) BATMAN FOREVER IS THE BEST and (3) this was totally a collectible mug from McDonald's and so it is not made anywhere! So I flipped my lid. And then I gave it to them to shelf. And both of the teens I was serving with were like "Lisa no seriously, you need this." And that was really all the motivation I needed! I left a donation and took this home with me and it was the best decision ever because not only do I get to have coffee with The Dark Knight on a regular basis, but I get to remember what a great trip I had in Chicago with those dudes. Right? SO GOOD. Okay so maybe you'll notice that my collection is definitely missing some literary inspiration. 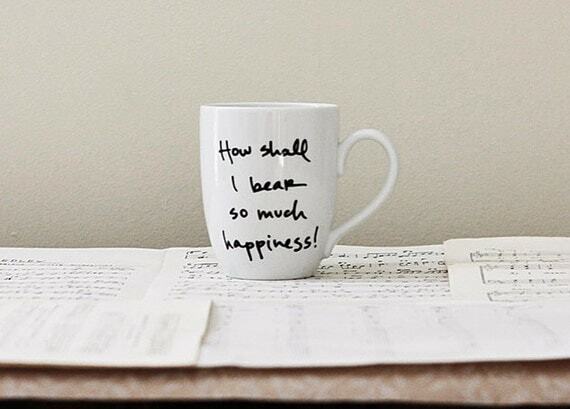 WHO AM I that I don't have bookish mugs? Whatever I totally count this as a bookish mug. 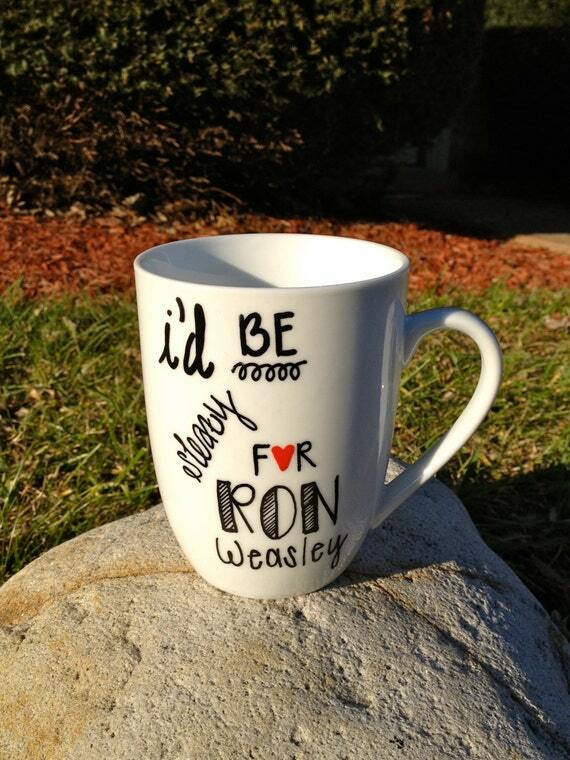 And yeah Ron, I would. I love Finn & Jake something fierce, y'all. Okay, I'm done with my confessions - but you're not! Tell me about your favorite coffee mug! Share a picture with me on the Twitter! OR you could link it to me in the comments. 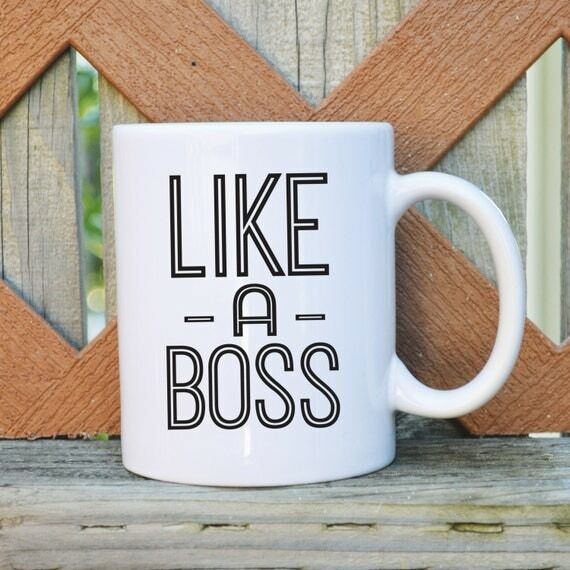 OR OR OR if you have other coffee mugs you think I should have on my radar, please let me know that too! The collection. No two matching mugs to be found! I do love the sound of that "All I need is books and tea" mug! I support you expanding your collection to include the banned books mug, Mel! This has to be one of my favorite posts! I love coffee mugs, though I do my best to curb my collection now that I'm living in a pretty much perpetual state of transit. I bet that will change when I finally have a home with hubby ;) That said, you have a pretty darn awesome collection! I think my favorite is the first one, just because it's so pretty! It's so hard to give up the collection! 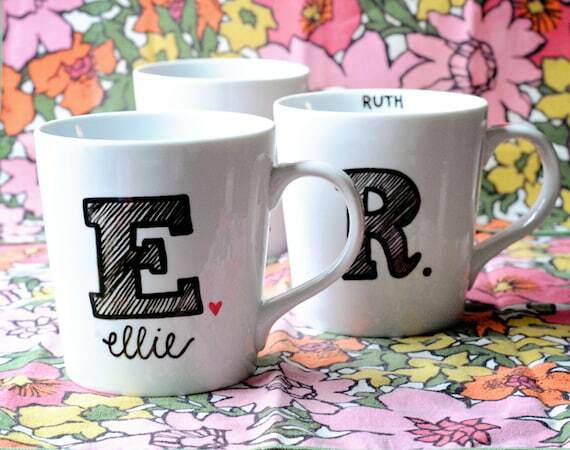 There are just too many adorable coffee mugs in this world, man. I am also a coffee mug addict which is weird because I don't even like coffee. Unless said coffee comes from Starbucks and is doctored up so I can't even taste the coffee. I love love love love love your collection! 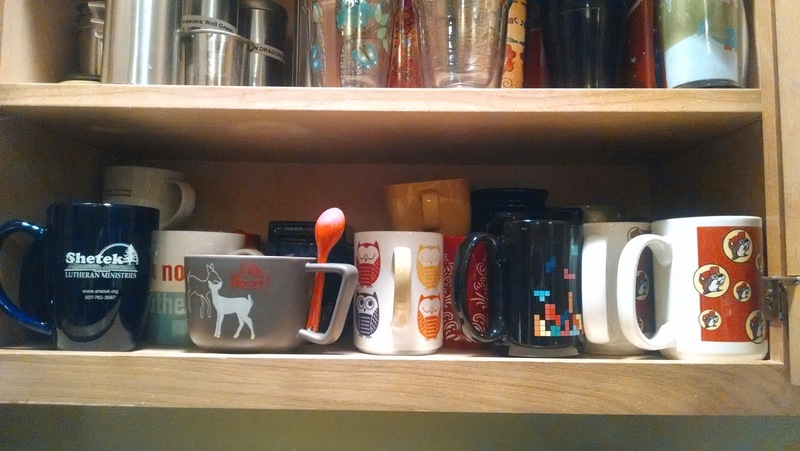 So many awesome and nerdy mugs. I just can't handle it! I agree that life is just too short to have matching mugs! I honestly don't know what I would do without a Starbucks near me. Probably have more money in the bank but I would not be nearly as happy as I am with a little Starbucks running through my veins. I love all of these! I own one coffee mug, and it's a plain Disney one. I must buy more! That owl one is adorable and it would be perfect to take to the office with me. And I've been wanting a TARDIS mug FOREVER. 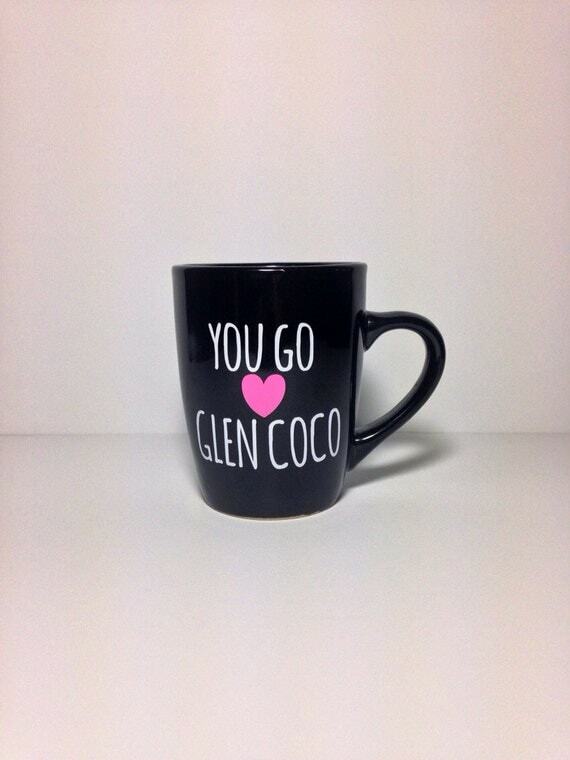 And AHH, that Glen Coco one! I need it. 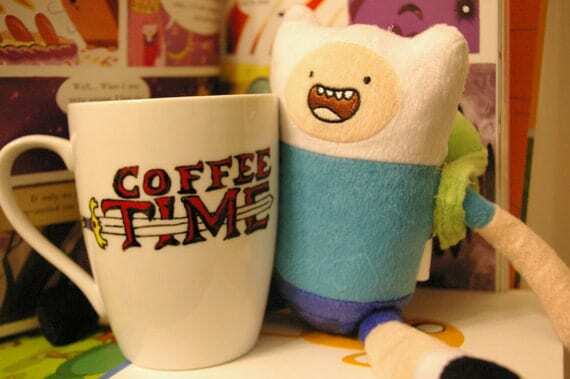 I want so many of these coffee mugs. Also, your collection is the best. I am a HUGEEE coffee drinker, but no matter how hard I try, I can't get into drinking out of mugs. I'm a tumbler girl, myself. I collect those the way you collect mugs. It's probably because I'm ALWAYS ON THE GO, and therefore need something I'm able to easily travel with. Either way, I love you owl mugs and they make me want to buy mugs for myself.